Nintendo cleaned house over the week of Black Friday, selling a combined 1.5 million Wii and DS systems, more than tripling the sales of the PlayStation 3. This might be a bit of bad news for anyone gleefully awaiting the fall of the Big Mario Machine. According to internal sales estimates, the company banged out 900,000 Nintendo DS handhelds and 600,000 Wii consoles in the U.S. over the week from November 21 to 27. 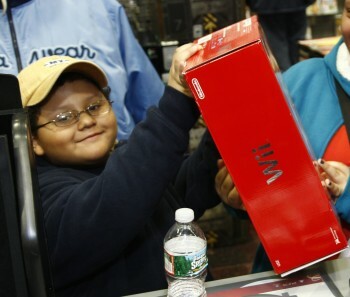 Nintendo of America President Reggie Fils-Aime did the math and said it worked out to roughly 9000 Nintendo systems sold for every hour of every day of the Black Friday sales week. Sales of the PlayStation 3 were significantly slower but still represented "an amazing start" to the holiday season with more than 440,000 units sold in the U.S. over the past week, which Sony said in a statement to Gamasutra represented an "all-time high" in demand. Microsoft has not yet released Black Friday sales numbers for the Xbox 360. Black Friday is the day following Thanksgiving in the U.S. that traditionally signals the beginning of the holiday shopping season and is typically marked by big sales and chaos at retailers. While primarily a U.S. phenomenon, Black Friday sales are becoming increasingly common in Canada as well. The rather oddly named shopping day is widely believed to represent the point at which retailers begin to operate "in the black," although for people who have retail jobs it simply tends to be the darkest, most awful day of their work year.